Middle school students [7th and 8th grade] at Raul Yzaguirre School For Success [RYSS], Houston, Texas, U.S.A. participated in a classroom assignment involving GIMP 2 [Photoshop equivalent] photo software and vocabulary building through word identification/meaning via the Internet. 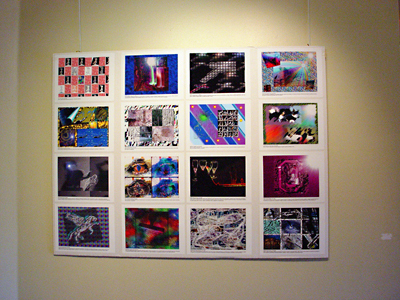 The students were given Grade 7 and 8 Language Arts [TEKS/TAKS] words to research the meaning of online then translate those meanings in photo software as Digital Art. 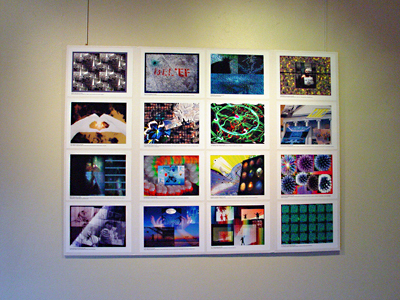 As a result, vocabulary enhancement came to the forefront with acquired skills of manipulating photographs ... utilizing various tools and filters within the software. 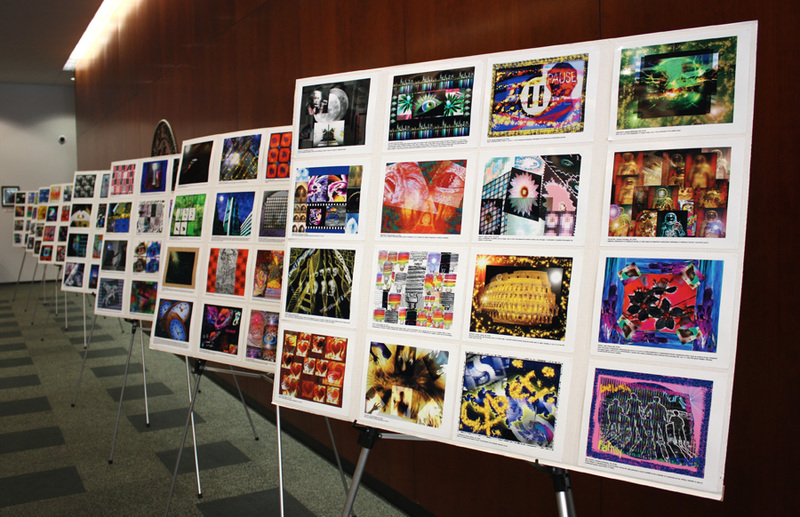 This cognitive and creative process placed the students in an environment of hands-on with photo software and the requirement of researching the word meanings to translate them into Digital Art through visualization. Digital Artists abound in all sectors as a part of this Digital Revolution we find ourselves a part of these days, which means this classroom process was also vocational in terms of building graphics software skills. Another interesting aspect to this project/process is the fact that the students took the vocabulary building assignments in stride to be able to visualize their word meanings as art and in this case, Digital Art. Disclaimer: photographs for the manipulations were downloaded from the Internet strictly for educational purposes. 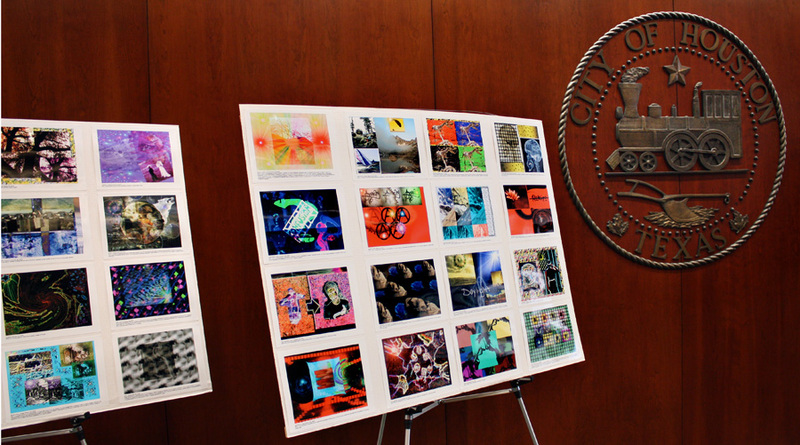 128 Digital Art prints by students from Raul Yzaguirre School For Success and short videos by students from Deady Middle School and Southmore Intermediate School [Pasadena ISD]. 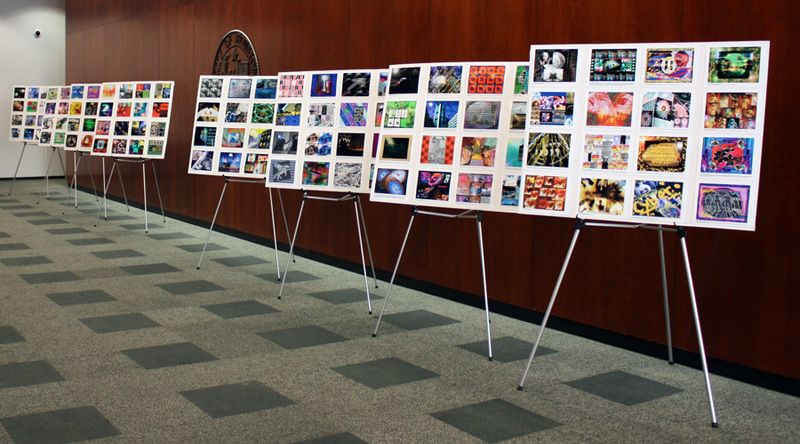 128 Digital Art prints by students from Raul Yzaguirre School For Success. 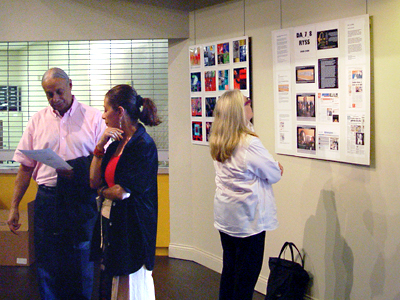 Philip Cano [Principal, Junior Academy, RYSS] talks with Amira Gongora Grynsztejn [Artistic Consultant and Talento Bilingue Representative] as Margaret Bott [Grants Program Director, Diverse Works] reads about the history of the Digital Art project. 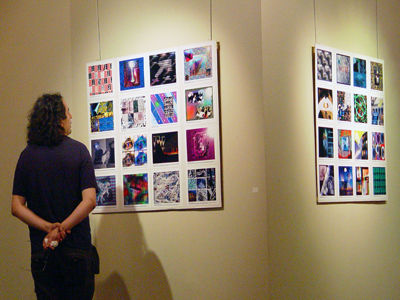 Ezekiel Solis [Graphic and Web Designer/Digital Artist] views some of the student Digital Art. 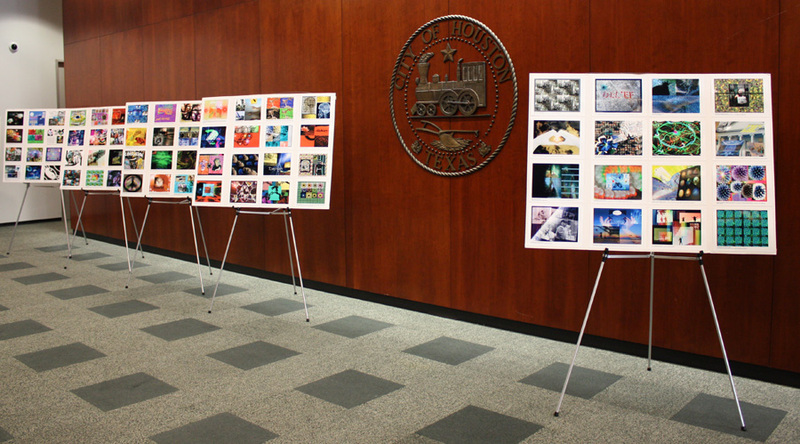 "I believe the most important aspect of this digital art project and its showcasing is the fact that a classroom assignment such as this ... or any other ... has transcended the confines of the room and the school system to provide impact or stimulus within the community. This impact or stimulus is a realization for the students who participated, their families, their school system members and community members that what happens in the classroom can also be transferred to outside situations within a real world context. The classroom assignment and its end result have moved from the student's notebook to a product on display for public consumption and evaluation. This fact indicates to the student that what he/she does can have more meaning within a wider setting. And because of this, it builds greater confidence levels to continue and in parallel with everyday activities in society." 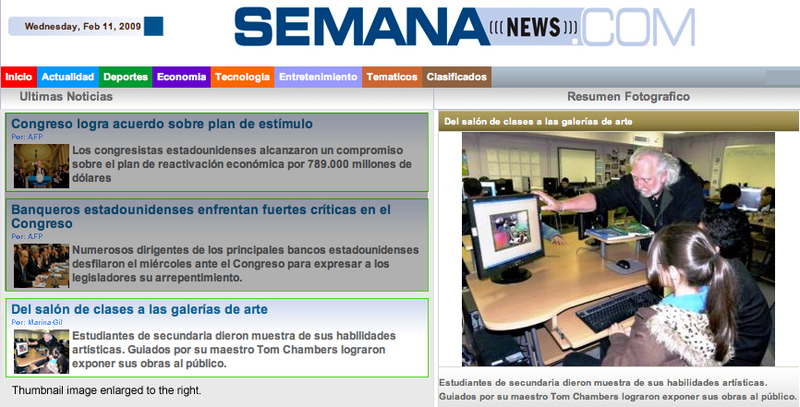 Tom R. Chambers, Teacher, Technology Applications, Junior Academy, Raul Yzaguirre School For Success, Houston, Texas, U.S.A.
"Estudiantes hispanos se expresan con arte digital", RUMBO, Houston, Texas [January, 2009][newsprint]. 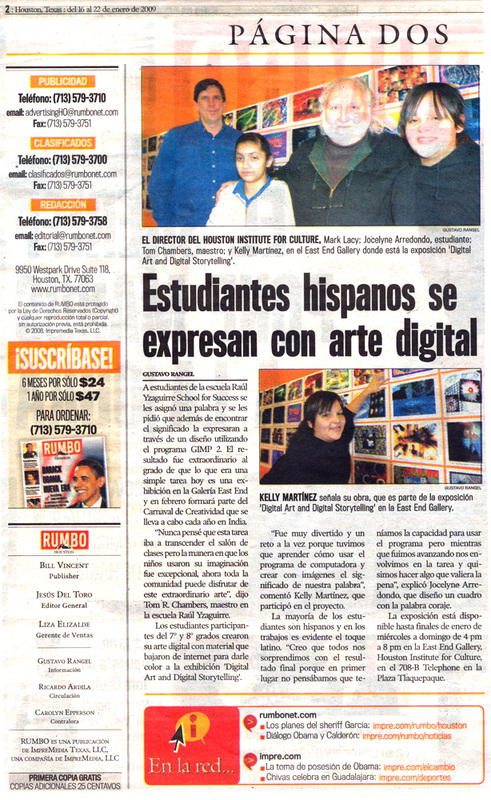 "Del salon de clases a las galerias de arte", SEMANA News, Houston, Texas [February, 2009][photo].